CodeRun Studio is a free, cross-platform Integrated Development Environment (IDE), designed for the cloud. 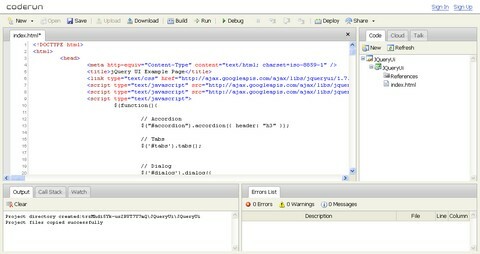 It enables you to easily develop, debug and deploy web applications using your browser. CodeRun Studio can be used instead or alongside your existing desktop IDE. You can upload existing code in order to test it in the cloud or for sharing with your peers. 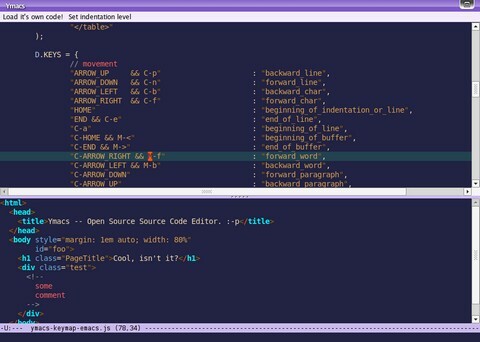 Ymacs is an Emacs-like editor that works in your browser. Which applies, at this state of affairs, only if your browser is Firefox. It looks pretty good with other browsers, but it is unable to catch all the required key bindings at the moment. If you are an Emacs user, then you should feel like home with Ymacs. By default Ymacs uses Emacs idioms and key bindings. It should be easy to customize it, however, to mimic other editors. On blogs that like to share snippets of code, it is common to use the <pre> tag to wrap the code so that the spacing/indenting is maintained and long lines do not wrap. While this is desirable behavior, it can be undesirable to have those un-wrapped lines break out of their containers awkwardly and overlap other content. XRegExp adds new regex and replacement text syntax, including comprehensive support for named capture. It also provides a suite of 12 functions and methods that make complex regex processing a breeze. And it lets you easily create and use plugins that add new syntax and flags to XRegExp’s regular expression language. XRegExp is fully compliant with the regular expression flavor specified in ECMA-262 Edition 3 (ES3), and has been tested with Internet Explorer 5.5–8, Firefox 2–3, Safari 3–4, Chrome 1–2, and Opera 9. XRegExp uses feature detection—no browser sniffing. Code reviews play an integral part in the development process for making quality software. We can find out security holes, memory leaks, poor queries and heavy file structures from code reviews. Unfortunately, these reviews are also very time consuming. We spend a lot of time echoing queries, memory stats and objects to the browser just to see how they are being used in the code. 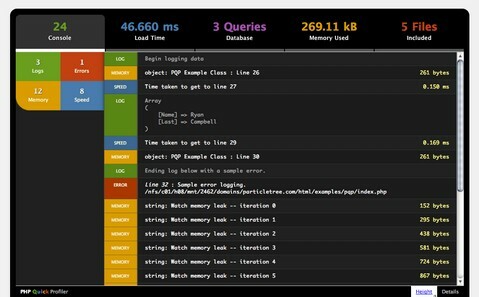 To reduce this repetition, Ryan Campbell has invested some time creating the PHP Quick Profiler (PQP). It’s a small tool (think Firebug for PHP) to provide profiling and debugging related information to developers without needing them to add a lot of programmatic overhead to their code. Now, we only need to toggle one config setting to true and we can have access to an automated tool to help create a faster and more consistent review experience. Since anyone can use it, PQP also gives the initial developer an idea of where their code stands before the review.